I recently received a “Suggest a Joint” from Lauren who recommended that I try out Moriarty’s Pub in Philadelphia, and since the wife and I had already decided to head out for dinner and a movie, we thought it would be the perfect time to swing in and see what all the fuss was about. Located on Walnut Street in Center City, this Irish pub was definitely a happening place on this gorgeous Saturday night. The first floor was packed with people around the bar and the sound of everyone’s conversations echoed like a big mishmash medley of voices. I wanted a little quieter spot to be able to hold a conversation, and because the outside seating was in high demand, we climbed to the second floor and went with the less noisy upstairs bar. Looking in the menu at the wing section, I notice “Philly’s Best” nice and large at the top. Being that this is my first stop in Philly, I don’t really have a comparison, so I’ll take their word for now and order up a bunch to see how they fly (get it, wing… fly – I got loads of ’em). The wings are sold by the pound and come in whole sections, meaning the drum, wing, and tip. 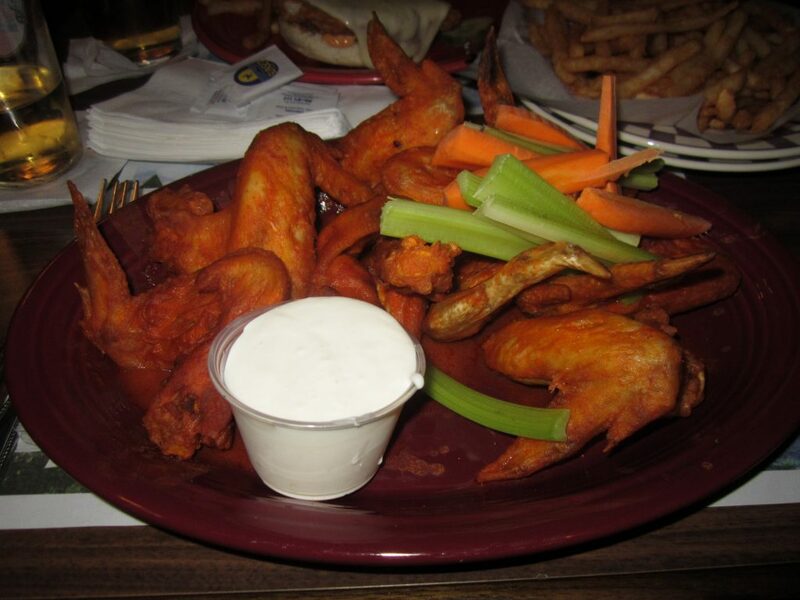 A pound usually equates to eight or nine whole wings and Moriarty’s only offers one sauce, so that is what I ordered. I sat back and watched a couple tag-teaming a plate of their own wings and saw how many wings I was about to receive. Now, I was with my wife (who I love, but doesn’t eat wings… I know, I know) so I don’t have the benefit of a tag-team partner and realize that it is all up to little old me to get the job done – and believe me, I don’t have any problem with that at all! The waitress came out with a discard bowl, some napkins, and wet-naps… and shortly thereafter delivered our food. The wings looked huge, but you have to dissect them to see their true size as the whole wing tends to give the illusion of grandiose. Once I did that, I am happy to say that they were still pretty large, and seeing how in reality it becomes 18 wings when broken apart, it left me feeling like I made out. They were lightly breaded and had a nice crisp to the skin, and the color was sensational. It all looked so good on the plate until I took the first bite and noticed that the wings were barely even room temperature. This probably played a role into why the meat was inconsistent with its tenderness. One wing was okay, the next was not tender, the following the same, and then back to tender again… so it really was a hit or miss with the meat. Overall the wings were a delight but left a lot of room for improvement. The tenderness and temperature of the meat was a little disappointing because these are things that could have easily been fixed and would’ve increased the taste with little effort. When the wings come as a whole they look pleasant and appealing, but when they aren’t that tender it makes it more difficult to break apart and becomes way more work than necessary… and I am way too lazy for that sort of thing. They are definitely better than the average bar’s wings and I enjoyed eating them, but I don’t know if I could call them Philly’s Best. I guess we’ll have to wait and see what the rest of Philadelphia has to offer.